This HiRISE image ( PSP_003464_1380 ) is a spectacular image showing gullies associated with distinct layers located at multiple elevations along one crater wall as well as multiple generations of dunes that are eroding or covering a more coherent rock structure. The gullies in this crater appear to originate at the layers that cover a large extent of the slope. 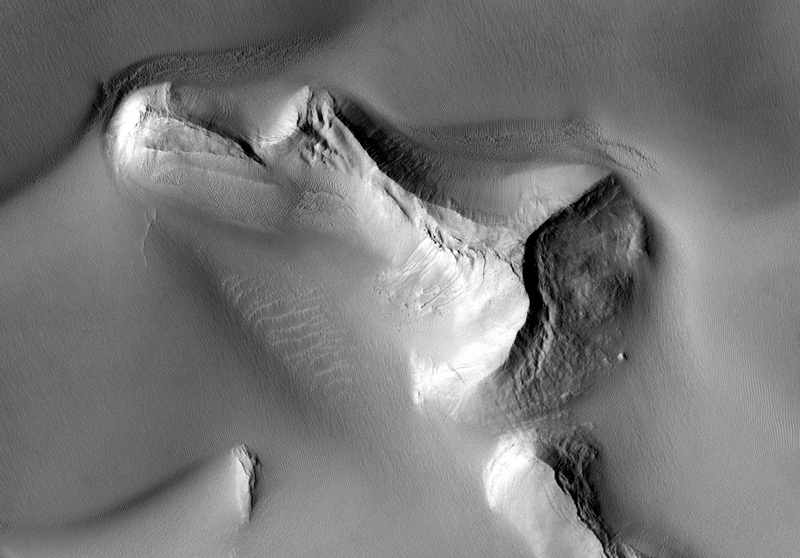 On the left side of the image, gullies can be seen emanating from layers in two distinct sets, each at a different elevation. Gullies are often, but not always, form near layers. Many of the gullies seen here have sinuous, or wavy, channels. The bends are called meanders, and on Earth, meanders form in streams that have sustained and/or repeated flow. Not all of the gullies seen in this image extend the same distance downslope. This could result from differences in water supply, sediment supply, slope angle, and time of formation, among other factors. Dunes are also visible in this image; they indicate the prevailing wind direction. What is particularly interesting about this dune field is that there is exposed rock in the middle of it. This rock is either being exposed as the wind moves the dunes away from it or it is being covered. The dunes appear to outline the shape of the rock, which suggests that the rock has been uncovered long enough for dunes to form around it. As the dunes shift over time, they will probably expose more of the underlying rock. 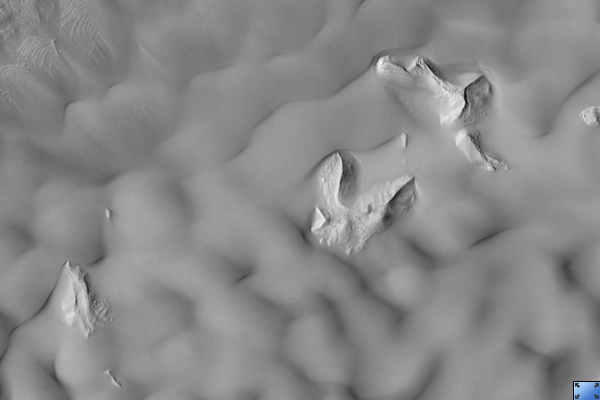 The subimage (~1 km across) shows several generations of dunes interacting with the protruding rock.